So Stefan went full VTV and sent out bogus DMCAs against YouTube user Tru Shibes, a channel that hosted many videos exposing Stefan's lies, misogyny, and abuse. What's interesting is that Stef is opposed to intellectual property and the state, but he has no problems with using the state to enforce his IP when it exposes his fraud. Not to mention the DMCAs are totally frivilious because they are textbook examples of Fair Use. Because there was such a huge backlash, FDR couldn't fit it all down the memory hole and has been trying to apologize for it with outright lies. 1. Privacy? There's an app for that. They have a flagging system and one of the reasons you can flag down a video is privacy. This action was never taken. 2. OK when 185,000 people hear me, but not 400 more. Tru Shibes channel's subscriber base pales in comparison to Stef's about 400 or so IIRC. Why is it OK when hundreds of thousands of people hear you but not OK for 400 or so more? 3. Your privacy is not covered in copyright law, it's covered elsewhere. You don't make the claim that they're infringing my copyright because other people's names are on a YouTube video. Doesn't follow. 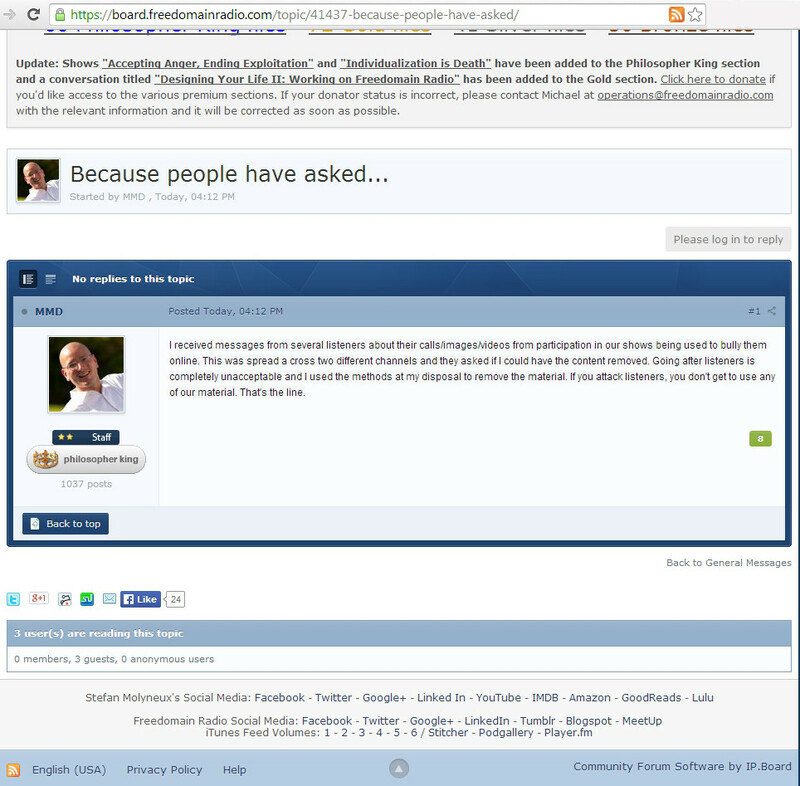 So I sent a e-mail to DeMarco about this topic on Aug 21, 2014 saying. Hey Michael this is TheBurgerKing (on skepticproject.com) or poopmeat (on freedomain forum) I was wondering if you would like to address issues or Stefan raised on skepticproject.com ( http://politics.skepticproject.com/forum/5631/stefan-molneux-anarcho-statist/ ) claiming that you flagged videos on youtube.com on behalf of freedomain radio. Is it ok if I post your responses publicly on SP.com as well if it's ok if someone else can copy/paste your response on wither websites as well? Still no answer. I have heard a lot about this within libertarian circles and will start a topic on SP.com about this.